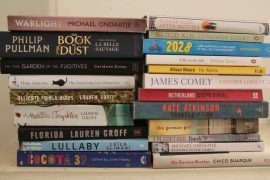 The hype that always surrounds the prestigious Booker Prize has already begun with the news that the Long List for 2013 will be announced on July 25th. Last year’s list provided some treasurers. Apart from winner Hilary Mantel’s Bring Up the Bodies, Tan Twan Eng’s The Garden of Evening Mists was probably my favorite read of the year and a book that everyone to whom I recommended it seems to have enjoyed too, Other memorable ones are Swimming Home by Deborah Levy, The Unlikely Pilgrimage of Harold Fry by Rachel Joyce, The Lighthouse by Alison Moore and Narcopolis by Jeet Thayil. It’s a big deal, for reputation and sales, to make it onto even the Long List of what is one of the world’s most prestigious literary competitions. So, who will make it into the spotlight in 2013? Apart from the judges, my guess is as good as any, so here are some possible contenders. TransAtlantic by Colum McCann: McCann’s novel, is divided into a series of narratives that skip back and forwards through momentous periods of history. It delicately weaves together the threads of the disparate lives, linked by the common factor of journeys between America and the United Kingdom, to create a delicate and haunting tapestry. That Deadman Dance by Kim Scott: Set in the early 19th Century, Scott explores the early contact between the Noongar People, traditional owners of land around Albany, Western Australia, the European settlers and some American whalers. At first Noongar man Bobby Wabalanginy manages to straddle the cultures, but as the differences become more apparent he is forced to choose his allegiances. Burial Rites by Hannah Kent: An Australian writing about the last woman to be executed in Iceland sounds a strange recipe for success but this debut novel has received international acclaim, and not least for the size of the publisher’s advance. Kent has a wonderful eye for detail and there is sometimes an almost musical touch to her descriptions which creates a richness around the bones of a great story. The Light Between the Oceans by M.L.Stedman. Set on an island far off the coast of Western Australia this fabulous debut novel has already been snapped up by filmmakers. Tom, a returned soldier, finds unexpected love when he marries the lively Isabel. As their attempts to have children founder, Isabel falls further and further into depression. Then a rowing boat washes up on the beach and a terrible secret slowly tears their lives apart. The Death of Bees by Lisa O’Donnell: The story of two teenage children forced to live on their wits and some unexpected compassion after their junkie parents die. A raw but highly effective take on what really constitutes family and the extraordinary power of survival. My longshot is Beneath The Darkening Sky by Somali-Australian Majok Tulba, a disturbing but in the end uplifting debut novel based on the author’s his real-life experiences among the child soldiers in Africa before arriving in Australia as a refugee.